32 posts categorized "Thursday Thirteen"
Thursday Thirteen ~ Thank You x 13! Well, it's been forever since I participated in a Thursday Thirteen post, but I thought what better way to show you some wonderful blog winnings in 2011 and say "thank you" to my benefactors and link to those bloggers who were so generous! My cup runneth over, truly! 1. Thank you to Shawna over at 1Choice4Quilting for sending me 4 yards of Sunkissed fabric!! I won it! It's beautiful, and I can't wait to decide which pattern to use! Thank you for your generosity, Shawna! By the way...for anyone interested, Shawna is having another giveaway of 4 yards of fabric--this time it's Happy Flowers, and the deadline to enter is Sunday, April 10. 2. Thank you to Sabrina over at Doodle Quilts. She was giving away a fat quarter bundle of the "Carriage House" collection from Wyndham Fabrics. Wow, it's a big bundle of fabric! I'm not sure yet how I will use it. Thank you, Sabrina! 3. Fabric designer, Sandy Gervais, had a giveaway over at her blog, Pieces From My Heart. Sandy sent me a layer cake of her new fabric line, Lovely and also a small petit-four pack of the same fabric. Love it! I can't wait to use this and ordered some lovely Lovely yardage from Burgandy Buttons to complete the quilt I'll make. 4. Rose in Australia, who blogs over at Greening the Rose, gave away 4 skeins of beautiful yarn recently. Yes, you guessed it! She mailed it to me!! And, being the generous person that she is, she also sent something to the girls--Hannah was delighted with some handmade paper, and Sarah received a watercolor flower picture for her room. Thank you so much, Rose! We all love our treasures! 1. I absolutely loved flying! This picture of the clouds from the window seat on our plane was one of the first things on our trip that I thought was amazing. 3. One morning we toured The Citadel in downtown Halifax. It was the only day of our trip that it rained a bit, and the weather seemed quite appropriate to the surroundings. I'd never heard of this historic place before...but if we go to quilt shops on vacation, then it only stands to reason that we go to historic places, too. Actually, it was quite interesting. Tom liked seeing and hearing the bagpipers, and I enjoyed the piping hot Chicken & Barley soup and homemade bread. 4. Just about everywhere we went we saw Canadian flags flying. The familiar white background and red maple leaves were everywhere we traveled. I loved seeing the Canadians' patriotism. 5. A full day of experiencing firsthand Anne of Green Gables. First, at Avonlea Village. There were many beautiful flower gardens to admire as we walked the streets, a chocolate factory where we watched candy and chocolate-coated potato chips being made, and a Wee-gospel singer in the village church to hear. 6. We enjoyed watching characters in various parts of the Village act out many scenes from the Anne of Green Gables' books. Left to right on stage below: Marilla, neighbor Mrs. Rachel Lynde, Anne Shirley, and Matthew in the rocking chair. 7. Next, that afternoon we toured the original site that inspired L. M. Montgomery to write the Anne of Green Gables' books. 8. To finish up our whole day devoted to Anne, that evening we attended Anne of Green Gables ~ The Musical at the Confederation Centre of the Arts. It was WONDERFUL!!! The actress who played Anne Shirley was outstanding and perfect for the role! 9. The parade celebrating Old Home Week just happened to take place during the time we were there. The floats, bagpipers, clowns, horses, Mounties, and giant balloon characters were great. I love a parade! 10. Seeing moose signs like this one in New Brunswick was exciting although we never saw a real moose! But the signs certainly kept my eyes glued to the road with my camera ready just in case! This was as close to a moose as I got. I thought I should take advantage of the opportunity while I could! 11. Ditto for not seeing a whale...we scheduled a whale tour; it was cancelled because of fog; we rescheduled, it was cancelled for the operators' family emergency; and then we changed plans so we could take a different whale-watching tour boat on the last day we were there. The ride waaaay out in the ocean in hopes of spotting a whale was really nice, but no whale tail to be seen. Here I am below ready to get on the boat. 12. Bay of Fundy ~ Hopewell Rocks ~ World's Highest Tides are here! We stood right down there on the ocean floor at low tide. It was amazing to think that in just a few hours everywhere we walked would be underwater! 13. The most fun thing of all was being with my sweetie and celebrating 30 years together! I hope you've enjoyed these past days of posts and pictures of our trip to Canada. Now, when will I get around to scrapbooking these 1700+ pictures?! Canada Part 1 ~ Meeting Island Sparrow in Real Life! 1. Don't you think it's time for a catching-up post since we've been missing in action on the blog again? Yes, I thought so! Did you miss us? 2. Lots of yard work has been completed this last week (the mulch pile is gone, but I almost need more! ), and the garden picket fence project is all done! I love, love, love the new picket fence!! 3. 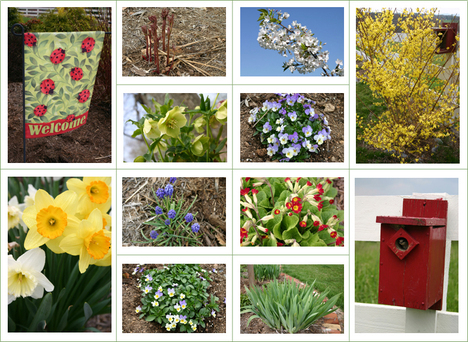 I've missed participating in Bloomin' Tuesday for the past two weeks, so here's a sampling of what's blooming in the flower bed that runs alongside the shed. Hopefully, I can post some up-close photos for the next Bloomin' Tuesday. 4. Hannah has been super busy in the garden tilling and preparing the beds; here she is planting a new asparagus bed. We've just discovered this spring that we love this veggie! Now we need patience to wait a few years for the bed to become established. 5. Granny and Hannah shopped for plants in anticipation of the last frost date of May 15th. Maybe we can get all the veggies in the ground while Granny is still here. 6. Mother's Day was an excellent time around here! Tom and the girls served breakfast in bed to Granny and me--both of us together in her bed! (No pictures, please!) French Toast and an edible fruit bouquet were the highlights...yummy! 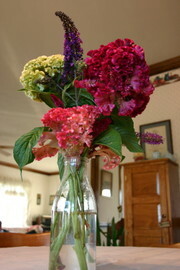 Plus, flowers from the garden, pictured above, graced the table. 7. We also enjoyed having guests visiting our home fellowship on Mother's Day, and Tom arranged a special treat for the mothers and grilled steaks and hamburgers for everyone for lunch. Hannah made Bobby Flay's delicious Fra Diavolo BBQ Sauce for basting. Yummy and spicy! 8. Sarah made a special Mother's Day chocolate cheesecake to serve. I'll post a picture here, and hopefully she'll follow up later with her recipe. Doubly delicious...and all gone so quickly! 9. Sarah and I attended our Saturday Sampler monthly class this past weekend...and took our completed blocks. That's always a good thing--to go with your homework done! Here's a photo of the Show &Tell portion of the class. It's inspiring to see what other quilters have done! 10. And have we mentioned how much we've missed Jonathan being around the supper table with us for the past week? He's been in Mississippi repairing planes his company sent there to help with the big oil spill. He may be gone another week or two? 11. And have we mentioned how much we'll miss Granny--not only around the table but around the house--when she leaves for my sister's in South Carolina? Hannah and I will drive her down and stay a few days, and Sarah will hold down the fort with Dad and Pepper. We'll get Granny back in August. 12. And Hannah, Tom, and I are gearing up to attend a Photography Boot Camp in northern Virginia with some of the families we met at the recent Hymn Sing. Jonathan had planned to go, and we will miss him participating! Hopefully, we can post about our excursion when we return. Sarah and Granny will hold down the fort with Pepper. 13. And if not enough is going on, I signed up for Julie's (Jaybird Quilts) Modern Siggy Block Swap. I already have the fabric needed (I won it! )...so basically it's almost a free quilt. I'll receive 100 different blocks from quilters all over the country and world, and they will receive one of my blocks! I just couldn't resist signing up! It will be fun since my friend Chris is doing it, too! That's what's been happening around here! Hope you all have a wonderful weekend. See you on the blog next week! Can you guess why I would love this next plate? It's a snowman with a red birdhouse and red birdies flying all around. Love it. (The other 11 plates follow on the continuation page). 2. The Valley is getting a welcomed gentle rain this morning. It's 60 degrees, and I love the coolness. My newly transplanted shrubs love it. They're looking a bit shriveled since being moved to a new location. 3. It's quiet around here...the girls are gone for the day helping a friend with cleaning and watching the other children and holding a new little third-born that was added to their home. They will have fun lending a hand. 4. It's quiet outside...no crews making noise in the backyard today; they'll be back on Monday. Here's what the brick-layers finished this week. Now we await the framers to arrive. Soon it will start looking like a real room! 5. My mom has an offer on her house! 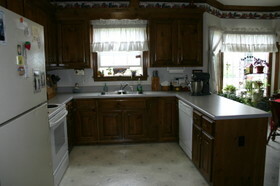 The potential buyer will decide whether to accept her counter-offer. We are really praying that this will be over soon for her. Mix pineapple, sugar, flour and cheese in a 7x11 dish or 9x9. Melt butter and mix with crackers. Put over top. Bake 20 - 30 min at 350. It's yummy and different! 7. I just started a Wonky Star quilt block, a first for me...will post a picture soon. 8. The fall pansies are all planted, and mums and asters are in the pots down the front steps. These are my first asters, and I love the purples! 9. I'm wondering how this little tyke is doing. I'm betting he needs some mittens on those chilly Michigan mornings! 10. My friend's son is getting married this weekend. l remember when I saw him as a newborn in the hospital. Where does the time go? We won't be able to attend the wedding, but we send Best Wishes! for Joseph and Stacey! "Hospitality is a concrete, down-to-earth test of our fervent love for God and His people. Love can be an abstract, indistinct idea; hospitality is specific and tangible. Hospitality is love in action and is the flesh and muscle on the bones of love. Through hospitality, the reality of our love is tested." 12. With the cooler fall weather approaching, some hiking trips are on the agenda I'm sure. 13. The garden is winding down with not much produce coming in now, but we're still picking and shelling black-eyed peas...my favorite vegetable. It was a good season, and we'll enjoy Hannah's hard work all winter. *And why all these pictures are pixely I don't know; maybe it's because Hannah isn't here to help me! Thirteen Things We've Been Doing on Our Blog Break! Well, we've had a very enjoyable week away from the computer and thought it would be a good time to catch everyone up on what's been going on around Mountain Musings lately. 1. My mom and her friend, Evelyn, visited for lunch one day last week for my birthday. We took them on a tour of the gardens--you can see the tall sunflowers behind them. My mom will be 80 in a couple of weeks, and her friend is 85! They drove three hours to get here and drove back home the same day after their short visit. 2. The girls prepared a delicious lunch for the special occasion. Our menu: Ham Broccoli Ring, Tomato & Cucumber Salad, Sugar Snap Peas, Ring of Cantaloupe topped with raspberries and blackberries from the garden (along with watermelon balls), and Key Lime Pie for dessert. Yummy! 3. And don't forget the Peter Paul Mounds Cake! ** After our company left, Sarah got busy in the kitchen baking a birthday cake. I have requested this particular chocolate cake every year since I was a little girl! It's unfortunate the guys don't like coconut, but it's only once a year. 4. Tom scheduled a vacation day and took me downtown to The Pampered Palate for lunch. We always enjoy the time we spend together. I took my camera and forgot to take a picture! 5. One of our errands while out (a surprise!) was looking at picnic tables over in Stuarts Draft! I have wanted an outdoor table for awhile now, and it was just delivered this week--a big one that seats 10 and 2 extra on the ends if needed. We haven't initiated it yet--who wants to come over and help us try it out? 6. The 4th of July holiday was a very nice celebration at the home of one of our church families. After target practice with really LOUD guns, there were lots of afternoon games: balloon toss, 3-legged race, wheelbarrow and gunny sack races, tug of war, and hula hoops! Here's Jonathan on our family's team trying to get the hoop over to Sarah. Thankfully, I was the official photographer for the day and, instead of jumping in a sack, participated by taking pictures of everyone having fun! Quite hilarious! We all had an enjoyable time and some sore muscles and bruises the next day! 7. Our contribution to the July 4th cookout was Sarah's Turtle Trifle**--an outta-this-world delicious chocolate dessert! Doesn't it look yummy in this punch bowl? 8. Even though we were taking a blog break, garden chores didn't take a vacation--the raspberries keep on a'coming, and the green beans need picking! Hannah also harvested the rest of the lettuce and keeps the Mountain Musings' kitchen well supplied with her garden produce. 9. Also, we've been out measuring the garden in order to answer a question a commenter recently asked about the size of our garden. Well, we actually have two gardens because we quickly outgrew the original one. The "old" garden has four raised beds (made with 2" x 6" boards) that are 26' by 4', 15' by 3', and 15' by 5' long. There's a middle mounded row between the two longer raised beds that is 26' by 2'. The "new" garden is for spreading vegetables like watermelon, cantaloupe, pumpkins, acorn and butternut squash, and gourds (our first try at gourds). Also corn, raspberries, blackberries, and the strawberry bed are in this garden. All the flowers you see down in the new garden are volunteers: sunflowers, cosmos, cockscomb, and scabiosa are from last year's seeds being dropped. The new garden measures approximately: 62' x 50'. I'm gradually working on making a flower bed around the perimeter just like the old garden. I have two sides done so far, and I need brick or stone to go around the mulch for borders. I'm on the lookout for free bricks! 10. Yesterday Hannah made some Zucchini Squares for lunch with her first zucchini of the season. We are hoping a few more will be ready before Sunday as we're preparing Vegetable Lasagna for our fellowship meal. 12. During part of our blog break, we've been busy working on all the necessary preparations for our next two Keepers at Home skill days. Hannah is teaching calligraphy, and she and I are teaching scrapbooking at the end of the month. 13. Finally, we relaxed and enjoyed the sunset (picture taken by Hannah from our front porch). Everyone have a wonderful weekend ~ see you on the blog on Monday! Thirteen Signs of Spring around Mountain Musings! Thirteen Things I LOVE about God's LOVE. Nor could the scroll contain the whole, Tho' stretched from sky to sky. Three females! Our kitchen is quite the gathering place with all of us vying for spots to work at the counter! When we have company over, I'm the main dish preparer, Hannah usually takes the side veggie dishes and salads, and Sarah is the dessert girl. We all work together - such fun! Wallpaper: blue and white checkered wallpaper, chair railing, white wallpaper with cherries above the railing, and a border at the top of jellies, berries, vines, a butter crock, and a pitcher--very country decorated. Fresh flowers: thanks to Hannah and her flower garden we always have fresh flowers on the counters and the table. Here's a picture of the giant cockscomb she grew this year. A Pantry: This is our first kitchen with a small pantry, and it's great to have the extra room. Right now it needs a good fall cleaning! Frogs: there are only 5 frogs in the kitchen, mostly on the window sill and on the bakers rack where we keep plants. My favorite is the one holding a plant in the top of its body. 13 Baskets! We have baskets and more baskets, thanks to my mom's basket making hobby: utensil basket, market basket, egg baskets, cookbook basket, napkin basket, trash basket (where we keep our phone books), potato masher basket that holds candy, and some granny baskets. 8 Scripture verses. Two of my favorites, one we have on the fridge: "A generous man will be prosperous, and he who waters will himself be watered" (Proverbs 11:25) and my life's verse on a wall plaque: "For I know the thoughts that I think toward you, saith the Lord, thoughts of peace, and not of evil, to give you an expected end. And ye shall seek me, and find me, when ye shall search for me with all your heart" (Jeremiah 29: 11,13). 21 Houseplants include: shamrocks (a green one and a purple one), spider plants, several Christmas cacti, aloe plant (for kitchen burns), a spaghetti cactus, 3 pregnant onion plants, African violets, a jade plant (in the frog), and a snake plant. Too many cookbooks, two recipe boxes, and an antique rolling pin holder. A Pineapple Water Fountain: A gift from Tom one Mother's Day, it sits near the nook window by all the plants gurgling a calming fountain of water throughout the day. Currently: lots of garden tomatoes and green beans fill the counters waiting for Hannah to can or freeze; Amish Friendship Chocolate Muffins from Sarah's last baking day waiting to be eaten; and bread dough rising for tonight's meal. In honor of September being Classical Music Month, here are Thirteen Classical CDs we enjoy listening to. Of course, this isn't an exhaustive list. :) Plus there are even more classical CDs at the library. At the moment, I have checked out: a James Galway CD, one by Yo Yo Ma, and another featuring Mozart. We like to listen while doing the dishes, when company is coming, while drifting off to sleep, and really almost anytime in between. :) Does anyone else enjoy classical music? What are some of your favorite composers, compositions, or musicians?